Simon Lewis has been a human and a vampire, and now he is becoming a Shadowhunter. But the events of City of Heavenly Fire left him stripped of his memories, and Simon isn't sure who he is anymore. He knows he was friends with Clary, and that he convinced the total goddess Isabelle Lightwood to go out with him…but he doesn't know how. And when Clary and Isabelle look at him, expecting him to be a man he doesn't remember…Simon can't take it. 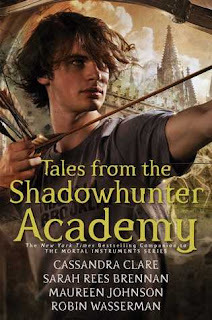 But the Academy is a Shadowhunter institution, which means it has some problems. Like the fact that non-Shadowhunter students have to live in the basement. And that differences—like being a former vampire—are greatly looked down upon. At least Simon is trained in weaponry—even if it's only from hours of playing D&D. Join Simon on his journey to become a Shadowhunter, and learn about the Academy's illustrious history along the way, through guest lecturers such as Jace Herondale, Tessa Gray, and Magnus Bane. These ten short stories give an epilogue to the Mortal Instruments series and provide glimpses of what's in store in the Dark Artifices. I really enjoyed reading this 2nd collection of stories! Because sometimes it's Simon and his adventures, and other times, it's the stories told by others that relate to what's going on. Like the one tale of Will's son at school and yeah, that was kinda hard to read! I think one of my favourite stories was the one that Robert Lightwood told, of the beginnings of the Circle, to show the students how easy it was to fall. And he demonstrated it by having Isabelle entice the students, and that it was a lesson and almost all of them failed, yeah. That was a pretty amazing story! Another one of my favorites was when Alec and Magnus become parents by means of adoption of a warlock baby abandoned at the academy. How Magnus wasn't expecting that they'd permanently take care of the child, but the Lightwoods gathered around the first grandchild/nephew. It was so cute and so moving! I loved it! There were so many ups and downs with Simon and Isabelle's relationship. That she had these memories of them that he didn't, and that's why he came to the school, to get away from those expectations. And the push-pull because they didn't know how to be this new couple. This covers the 2 or so years that Simon was at the academy. OF how he changed minds and attitudes towards mundanes and downworlders just because of who he was. Of the friends he made, and of the stories that were told that deepened the world. But oh, that ending was so bittersweet! This collection of stories was so fantastic and I really enjoyed reading it! Reason Why: Love this series, and these authors! And it's a Prequel & Sequel Challenge 2018 Book!